With the help of Jiji today we will be introducing something new; which will be the new category involving Real Estate, Home&Garden Improvement.A single room self contain is a popular choice for young people when it comes to real estate. It’s perfectly spacious for one or two tenants and it doesn’t cost as much as other options. However, single room decoration design can be tricky: you want your one room self contain design to have everything you need, but there isn’t too much space. Find out how to decorate a single room self contain in Nigeria and check out some great room ideas in Nigeria. The choice of furniture and decoration in your single room self contain property depends on who will be living there. 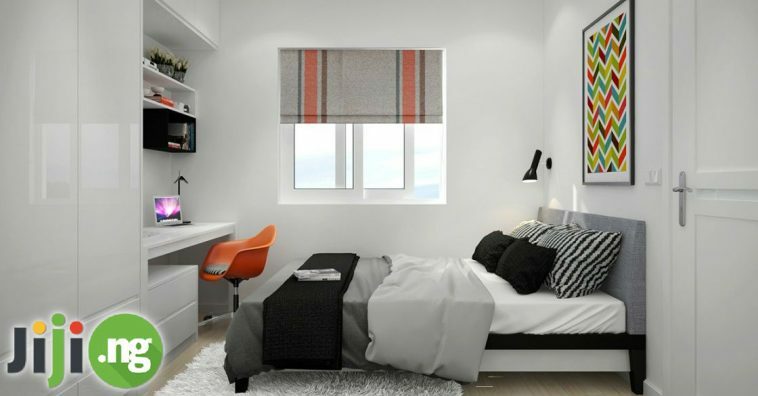 If you’re single, then the perfect single room apartment interior design is easier than ever – you don’t need much space and everything you require for living can be fit in flawlessly. Divide your room. Many roommates or families with children manage to live in a single room comfortably. The trick is to use a physical divider for the space. It can be a row of racks or book cabinets, or a line of blinds. Lighter colours work better for tiny places than dark shades. Focus on white, ivory, eggshell, dove grey and other pastel colours to make the room appear more spacious. Use space wisely. In a small-sized apartment they key to decorating is using every single bit of space available to you. Floating shelves, slide-out racks, fold-out tables, magnetic strips and hooks are only few of the storage solutions you can use in your tiny place. Scale down your furniture. Large and bulky furniture may be trendy right now, but it’s not a good choice for a tiny apartment. You can easily find small tables, armchairs, closets, chairs, and other pieces that will fit perfectly. Add a plant. A small-sized room full of furniture can feel heavy and airless, which you can effortlessly fix with just one live green plant placed somewhere in the room. If you’re lucky enough to own this type of apartment, you have almost unlimited opportunities for furnishing and decorating your place. A typical room and parlour self contain plan has just the right amount of space for any type of family, so you can’t really go wrong with choosing any of the popular designs. If you’re moving to a room and parlour self contain with your spouse and children, the ideal decorating plan is to turn the smaller room into a children’s bedroom and have the parents sleep on a sofa in the parlour – that way the parlour will double as a lounge area and a bedroom. Take a look at some amazing house design plans for room and parlour apartments!